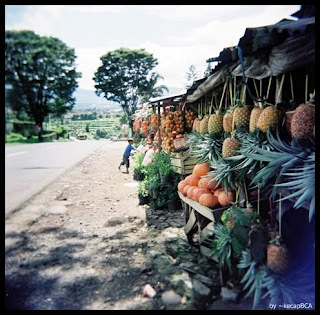 Along the way from Bandung to Tangkuban Perahu mountain, at some spots the tourist can found Fruit stall. Most people from Saudi Arabia loves pineapples. The pineapples stall is in Setiabudhi area. We can ask the seller to peel the pineapples and eat there or take away. The price is between Rp. 10.000,- rupiah until 15.000 rupiah per piece. This Fruit comes from Subang city near Tangkuban Perahu mountain. The taste is sweet, refreshing, and tasty compare with pineapple from other place. 1. Pick yellow one but not too old. If too old, the fruits taste is not so good. 2. For most Indonesia people, pregnant woman is forbid to eat this fruit. It can cause you abortion. 3. Better had breakfast or lunch before eat this fruits. 4. As usual , if you good in bargaining, you can get the fruits with cheap price.